Kobina* was in the computer lab of her elementary school in Toronto when the principal came to tell her that her mother was picking her up early. The eight-year-old grabbed her coat and bag, excited at the prospect of a free afternoon. But when she saw her mother sitting in the backseat of a police car, everything changed. The police car drove Kobina and her mother, Jane*, to a low-lying building sandwiched between a Jiffy Lube and a used car dealership in the city’s west end. Security guards patted them down and removed any objects that could be construed as dangerous, including Kobina’s school agenda, with its ring binding. 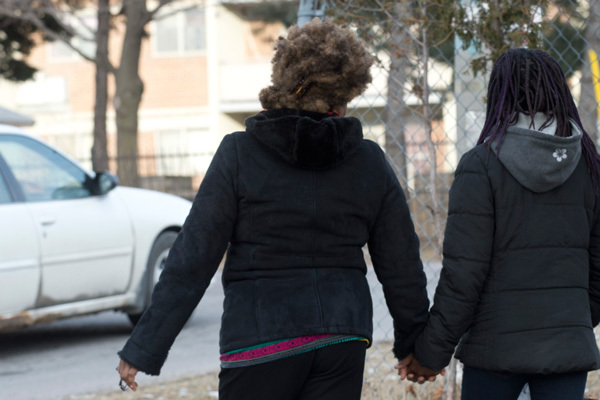 It was the first of 385 days that the mother and daughter would spend in Toronto’s Immigration Holding Centre. Every year, thousands of migrants land in detention in Canada (in 2013, it was 7,300). A third of them are put in provincial jails, alongside inmates facing criminal charges or serving sentences. The remaining are distributed between Canada’s three Immigration Holding Centers in Montreal, Toronto and Vancouver, run by Canada Border Services Agency. The grounds for their detention are administrative. For example, a migrant with no documents may be detained while immigration authorities are trying to establish their identity. A migrant may also be detained if they are considered a danger to the public, are under a deportation order, or are considered “unlikely to appear” at immigration hearings. The latter was the case with Jane, who, after being denied asylum on the basis of gender-based persecution in Ghana, had been living “underground” in Toronto for several years prior to being apprehended. Kobina knew that her mother had fled to Canada from Ghana years before Kobina was born and that her mother had an outstanding issue with Canada’s immigration authorities. But Kobina, Toronto-born and a Canadian citizen, had no way of knowing that she and her mother could possibly land in the equivalent of a medium security prison for over a year. The University of Toronto’s International Human Rights Program estimates that between 2010 and 2014, an average of 242 children in Canada were detained annually for immigration reasons. This estimate falls well beneath the actual number, as it does not account for children like Kobina, who are themselves not under formal detention orders but are accompanying parents who are. Canada’s detention of migrant children has drawn widespread criticism both within Canada – immigration lawyers, medical associations and community advocates have been lobbying the federal government for years to end the practice – and beyond. The United Nations’ Committee on the Rights of the Child has repeatedly chastised Canada; in a 2012 report, it claimed to be “deeply concerned that the frequent detention of asylum-seeking children is being done without consideration for the best interests of the child” and urged Canada to use detention only as a measure of last resort. The University of Toronto’s International Human Rights Program estimates that between 2010 and 2014, an average of 242 children in Canada were detained annually for immigration reasons. This estimate falls well beneath the actual number, as it does not account for children who are themselves not under formal detention orders but are accompanying parents who are. Lawyers at Legal Aid Ontario’s Refugee Law Office were alerted to Jane and Kobina’s situation by an NGO that operates within the detention centre. They were so appalled that they contacted Immigration Minister John McCallum, who intervened personally, granting Jane temporary residence status. They were released the next day. “Migration is not a crime,” says Dr Michaela Beder, a Toronto-based psychiatrist who has assessed many migrants in detention. “Many are already suffering from trauma or mental illness from their migration.” Beder has found that the jail-like conditions of detention invariably exacerbate existent problems while contributing to depression, anxiety, regression and suicidal thoughts. Kobina describes her days in the detention centre as profoundly boring. Woken by an alarm, she gathered with all the others for meals but she often didn’t eat, describing the food as “oil clogged.” If there was dessert at all, it was “cookies from Dollarama” and only at her mother’s insistence did they get fresh vegetables in the form of salad. While there were sometimes other children in the center, most were younger than Kobina and she didn’t really make friends. The detainees were allowed to go outside into the yard once a day in the winter, twice a day in the summer. Kobina says the children were given deflated soccer balls to play with. Kobina spent most of her time reading. When legal aid lawyers and staff got involved in her case, they became a conduit for her favourite books, including mythology and the Geronimo Stilton series. A French Immersion student, Kobina is fluent in both English and French. Three and sometimes four times a week, a tutor came to work with her for two hours. This was always the highlight of her day. But the little acts of random cruelty remain deeply etched in her memory – like when the long-awaited container of Vaseline® arrived in the mail, to help with dry lips and skin, and the security officers confiscated it “because it is petroleum jelly.” Or Christmas day, when the center manager told Jane he was going to call Children’s Aid to have Kobina taken away. Or the time Kobina had to be taken to hospital emergency for a nose bleed that wouldn’t end and the guards only allowed her mother to accompany her if she wore handcuffs. Jane, now working as a parking attendant in Toronto, awaits permanent residency. It is expected to come soon but until she holds it in her hand, she feels vulnerable – which is why she did not want to be identified in this article. Her lawyer Andrew Brouwer points out that she has been perfectly compliant with authorities since her release. Kobina is ecstatic to be back at school. “I was so relieved to find that I was up to speed with everyone else,” she says. Last spring, the Ontario Council for Exceptional Children, a provincial not-for-profit, presented her with an aptly named “Yes I Can” prize. In 2016, the Commission called for independent monitoring and oversight of the Canada Border Services Agency in relation to migrants and other foreign nationals in detention. Currently, many migrants held in detention have no access to human rights protection. This is in part because the Canadian Human Rights Act protections only apply to people who are legally present in Canada. The Commission has argued that by preventing someone from leaving Canada, they can no longer be considered “not lawfully present”, and therefore should be able to access Canada’s human rights protections. On average, 86% of children detained under a formal detention order are held because they are believed to constitute a flight risk.